Adding to the historic importance and interest of Veblen House--a 1920s prefab with unique custom elements inside and out--are the colorful and consequential lives of those who lived there. The process of internet research is a bit like fishing. You cast some keywords out into cyberspace and see what old newsclippings come back. Below is a sampling. 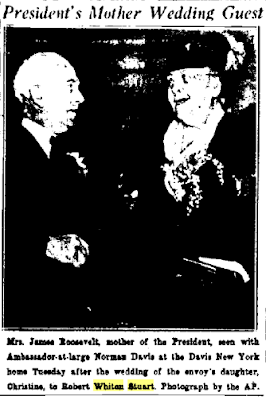 Jesse Paulmier Whiton-Stuart and Mary Marshall Ogden, the couple that brought what would later be called the Veblen House to Princeton, had two children, Robert and Sylvia. Research on Sylvia's three marriages beyond a preliminary post is on pause for the moment. Initial searches yielded little about Robert's life, but though we still know little about Robert himself, recent research has revealed remarkable connections, including with some extraordinary conservationists. Robert was born in Manhattan on Dec. 16, 1909, and grew up there, except for a few years in Prescott, Arizona, when father Jesse decided he'd rather run a cattle ranch than sell real estate in Manhattan. (Though he grew up in Manhattan, Jesse was as much an avid outdoorsman as Oswald Veblen.) Educated in Switzerland and at Cambridge University, England, son Robert chose a career related to his father's, as a construction engineer based in NY. During the time when his parents were living here in Princeton, Robert married Christine Paschall Davis, daughter of Franklin D. Roosevelt's ambassador-at-large, Norman H. Davis. 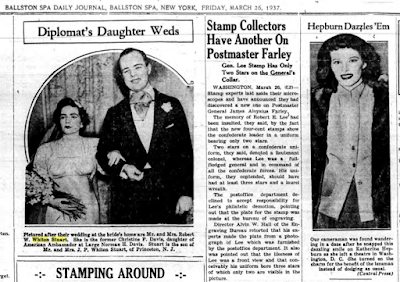 FDR's mother attended the wedding, March 23, 1937, at the Davis home on East 79th St.. Norman H. Davis had also been prominent in the Woodrow Wilson administration, serving as assistant secretary of the treasury and undersecretary of state. He was also at some point national chairman of the Red Cross. Lawrence M.C. Smith of Washington, DC, presumably a very close friend of Robert's, was the best man, and a quick internet search reveals that he and his wife, Eleanor Houston, had an extraordinary life as "collectors, conservationists, environmentalists, farmers, philanthropists, and preservationists." Like the Whiton-Stuarts, they were "old money", their lineage dating back to the days of William Penn. Eleanor's father developed the Chestnut Hill area of Philadelphia. She was inspired by Louis Bromfield's organic farming experiments at Malabar Farm (an important book for me as well, in my formative years), and was on the board of governors for the Nature Conservancy. She and her husband founded a classical radio station in Philadelphia, and raised organic beef on their Wolfe's Neck Farm in Freeport, Maine. Much of the property they acquired, including an island, was later donated for preservation. The Smiths' philosophy--"At some point you have to decide how to use your money to benefit society." --is very much the credo by which the Veblens lived. Christine died in 1946 in Harkness Pavillion, Columbia Presbyterian Medical Center, after a long illness, less than ten years after they were married. Her mother, the former Miss Mackie Paschall, died in 1942, and her father in 1944.This quote from a hometown newspaper is all we know thus far of what she did during her life. Born in Tullahoma, Tenn. the former Miss Christine Paschall Davis, was a summer resident of this town more than 30 years. She was graduated from Milton Academy, attended Vassar College and was graduated from the Presbyterian Hospital nursing school. For a time she was a nurse at the Manhattan Eye, Ear, and Throat Hospital. They had a son, Robert P. Whiton Stuart Jr. of New York. At the time of Christine's death, Robert was assistant to the president of the George A Fuller Company, contractors, a company that built Penn Station, the NY Times building, and other landmarks. In wikipedia, George A. Fuller is described as "an architect often credited as being the "inventor" of modern skyscrapers and the modern contracting system." Thus far, the most interesting thing we know about Robert is the sort of company he kept. His two additional marriages, to Bertha Clausen and Edwina Atwell Martin, continue this theme of marrying into extraordinary families. Bertha was from a prominent family of NY brewers. Her father owned an estate with a breathtaking view of the Mohawk River valley in a former hop-growing area of upstate NY, near the curative sulphur springs of Sharon Springs--a small town with a rich history. Edwina's story leads back to the extraordinary wealth of Andrew Carnegie's partner, Henry Phipps, as well as a grandfather whose firm built Rockefeller Center and the Lincoln Tunnel, and forward to one of her son's life-long devotion to conservation in Africa. One of Edwina's sons, step-son of Robert Whiton-Stuart, is Esmond Bradley Martin, Jr., a geographer who has dedicated his life to saving elephants and rhinos from extinction. A geometer, for those of us who live most of our lives without encountering the word, is a mathematician particularly skilled in geometry, which is what Oswald Veblen was. Because of his generosity and devotion to mathematics, every three years a geometer receives the Veblen Prize from the American Mathematical Society "for notable research in geometry or topology." And because of the Veblens' generosity and love of nature, people in Princeton and from far and wide get to take a walk in Herrontown Woods. A couple days ago, we were out there discussing trail work when a couple came by with a beautiful miniature collie. They were on their way from Boston to D.C. and had chosen Herrontown Woods as a midway rest stop for walking their dog because they were able to find our map online. Stories like that make us feel like the Friends of Herrontown Woods is on the right track. But this post is about recent backyard research, where a cold night frequently leaves finely crafted geometric renderings in a 35 gallon black tub that catches rainwater from the roof. Polygons, triangles and squares, oh my. How water molecules can climb up to make these ridges I haven't a clue, but the answer when it comes will only deepen our sense of wonder at nature's creative powers. Nor is it clear why the water in the black tub is more talented than other backyard miniponds. Maybe the shape of the tub affects how the water freezes, or minerals from the roof play a role in how the crystals form. In any case, it's like having a child genius who brings home a brilliant piece of artwork from pre-school every day. The forms in the lower right of this photo have the shape of beautifully cut precious stones. Here's a wish: May we keep the earth cool enough that this wondrous geometer can play, day after winter's day, far, far into the future. UPDATE: Writing this post brought back memories of a visit to the Exploratorium in San Francisco a long time ago, and an exhibit in which a sheet of cooled water froze in a flash. The speed with which crystals spread was surprising, though it makes sense, given how fast chemical reactions flash through our bodies to form thoughts and actions. I called the Exploratorium to ask for a video of the phenomenon, and they quickly responded. The exhibit is called Watch Water Freeze, and the inventor demonstrates the secret of the flashfreeze--supercooled water--at 7:35 in this video. Nature's combination of craftsmanship and speed is deceptive. The crystals in the photos above appear finely wrought, but it's possible they, too, were crafted in an instant. And might our creative process work the same way, that the mind becomes super-saturated with thoughts and experience, until some catalyzing moment arrives when all crystalizes in a flash of insight?